In residential design, personal history and nostalgia can often influence features large and small, gradually creating the identity of a space until it merges into something that clearly signifies the homeowner. 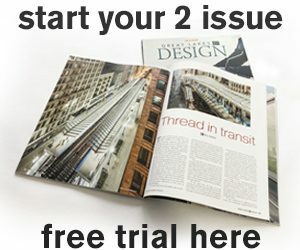 In the spring of 2017, Steve Werner, architect and partner at the Shoreline Architecture & Design Inc. firm in Petoskey, Michigan was approached by an unexpected figure from his own childhood—the owner of a Hudsonville, Michigan ice cream supplier near his childhood home—to design a seasonal cottage reminiscent of classic dairy barns. The seasonal residence—nestled on the Elk Lake shoreline—was designed to function as both a family gathering space and a refuge for relaxation for the couple; aspects of which Werner said determined the interior layout. The approximately four-bedroom, four-bathroom cottage is fitted with a sunroom porch, study, great room, and bunk room that sleeps eight, which features design choices made by the couple’s grandchildren. Each room, despite its purpose, was not particularly large, Werner said, to encourage family time outdoors. 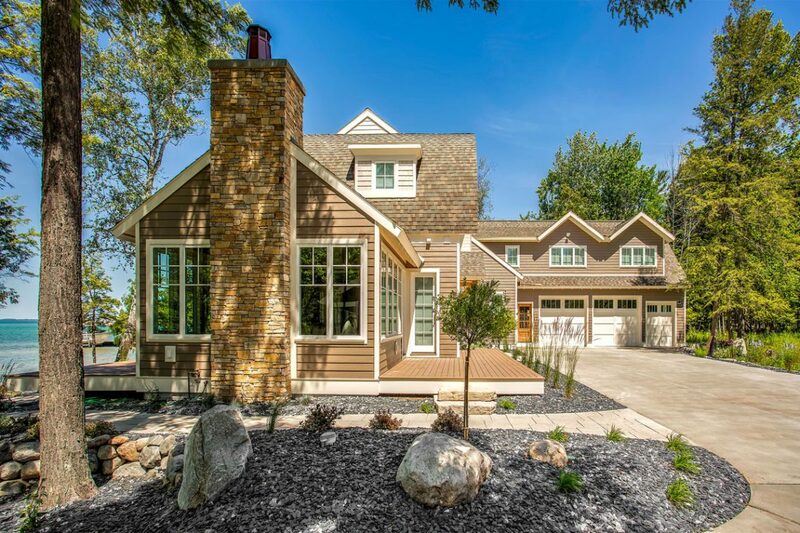 Apart from its familial inspiration, the Elk Lake cottage is designed to reflect the homeowner through its signature bow truss shape featured throughout the interior and exterior. 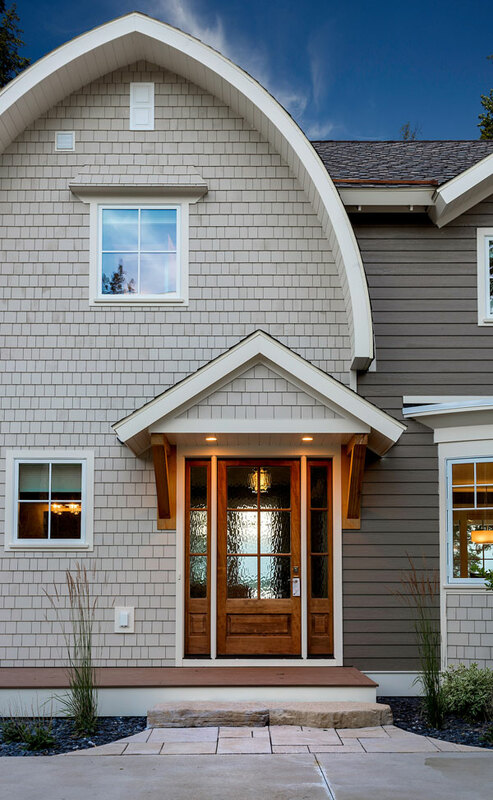 The traditional barn influence exuded by the rounded peak shape is completed in an appropriately light and friendly color palette: caramel and sandy hues cover wood hybrid siding and durable plastic composite trim. 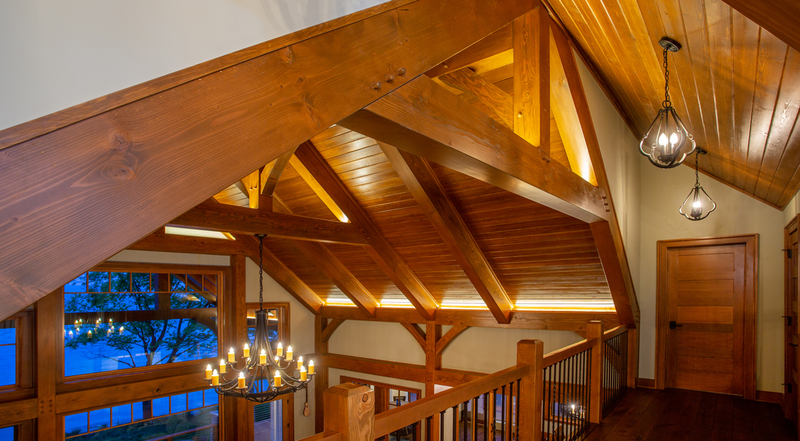 Indoors, the bow truss detail presents itself literally and figuratively. 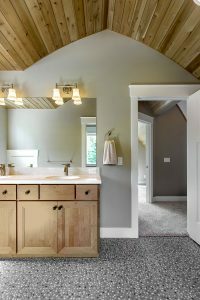 In some rooms, the asphalt room seems to grown inwardly through the ceiling—though this time in cedar—giving an appearance of separate barns being merged together with years of additions, a feature Werner said resonates nostalgia and a grown-in appearance. 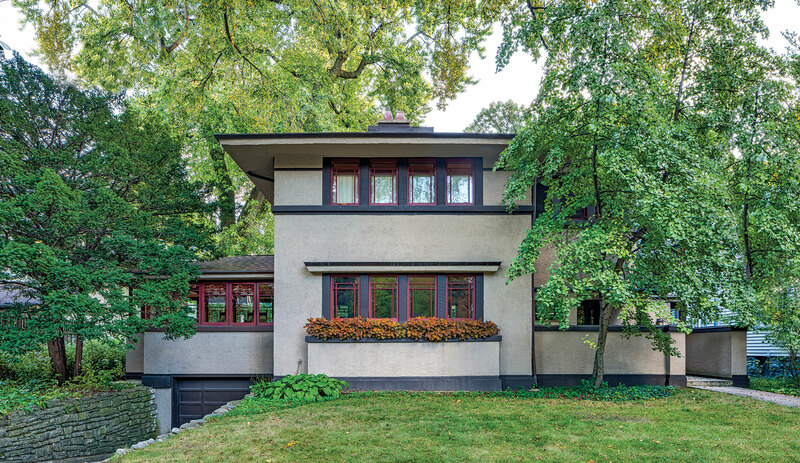 The shape itself appears elsewhere in the curve of countertops and cabinetry; the interior balcony overlooking the great room; and in the custom glazed kitchen window near the dining room. 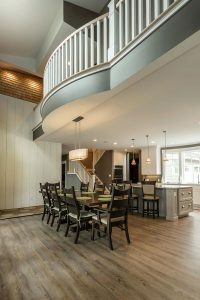 The final touch comprised a top-floor cupola originally added to filter natural light throughout the home, which would soon become a more whimsical feature with the addition of a spiral staircase to make it personally accessible at the top of the two-story cottage. At Shoreline Architecture & Design, architecture is defined as a means to enhance the human experience. 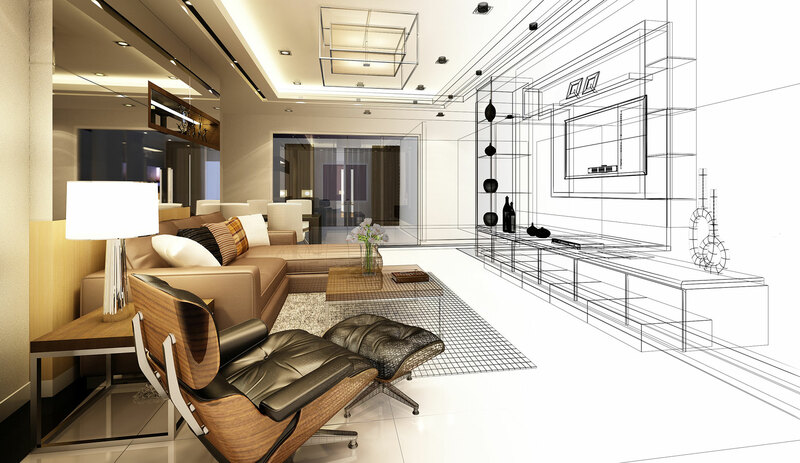 The firm’s services comprise interior and exterior architectural design, interior design, construction management, and site planning, among others. Its portfolio showcases a variety of commercial and residential projects gathered around a central philosophy that the spaces in which life unfolds should be crafted with careful attention and even lift the spirit. For Werner, the Elk Lake cottage project illustrated the firm’s philosophy as it involved a joyful exploration of personal taste and unique design elements that were enjoyable to craft. 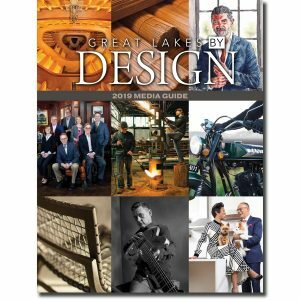 Photography: Shoreline Architecture & Design Inc.
ArchitecturebuildcontemporarycottageDesignElk Lakefarmhousegreat lakes by design magazinehomelakefrontMichiganresidentialShoreline Architecture & Design Inc.